When Cross Rhythms last reported on Mavis Staples we were commenting on her extraordinary comeback which has seen the veteran diva's 'We'll Never Turn Back' listed in many critics' Best Album Of The Year lists. Now, amazingly, there are even more accolades for the 71 year old singer. Her latest 'You Are Not Alone' won a Grammy in the Americana category. 'You Are Not Alone' was produced by Wilco's Jeff Tweedy. Mavis told journalist Fiona Shepherd that she was surprised at Tweedy's knowledge of gospel history when he played her his proposed selection of gospel standards for the album. She laughed, "I said, 'Where did you get those? Those songs are older than me!' So many people were asking me, 'What are you gonna do next?' and I didn't have a clue. But Jeff Tweedy had the answer. 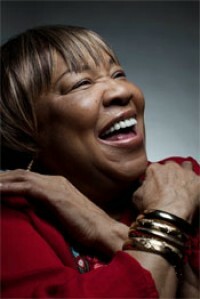 He brought me back to where I was and I feel so grateful for that because it's what put the Staple Singers on the map. I'm not screamin', I'm not whoopin' and growlin'. I'm just singin'." She told clashmusic.com how she'd met Jeff Tweedy. "I had a concert on the north side of Chicago at a little club called The Hideout. He came backstage after the show and let me know how much he enjoyed it. A week later, my manager called and said, 'Mavis, Jeff Tweedy wants to produce your next CD'. I said, 'Oh, you got to be kidding me?' He says, 'No. He told his manager to make it happen'. (Laughs) After he finally made me believe him I said, 'Well, that is great!' Because I like Wilco - I hadn't ever met them, but I'd heard their music." As well as the traditional songs like "In Christ There Is No East Or West", 'You Are Not Alone' contains songs by her father Roebuck "Pops" Staples and covers of numbers by Randy Newman, Allan Toussaint and John Fogerty along with two Tweedy originals. Mavis spoke about the song selection process. "We met at Wilco's recording studio. Jeff had these songs for me to listen to. I listened, and about the fourth song, this gospel classic traditional song started playing, and I said, 'Where did you...? How did you come up with that?!' This was a song that my father used to play for me when I was a kid! This was the Golden Gate Jubilee Singers. And he said, 'Oh Mavis, I like all of this old stuff like that. I thought this would be good for you.' I said, 'You got that right! I know these songs, but I never thought that I'd be singing them!' We chose about seven or eight songs out of the bunch that he had." One of the album's outstanding cuts is the title track, composed by Jeff Tweedy himself. Mavis remembered, "At the second meeting he told me, 'Mavis, I have this song title that's been going around in my head. There's a song I want to write for you called "You Are Not Alone".' He said, 'I don't have any of the lyrics yet, but I'm going to write it. I just feel like that would be something cool for you to say.' I said, 'Well, write it, Tweedy!' He wrote that song and two other songs while we were recording this CD. Tweedy kept me in my comfort zone. He really let me know that he knew me by the songs that he wrote for me and the songs that he had chosen for this CD. There's still the same messages that I've been singing all my life, the songs are still about the world today - jobs, poverty, welfare - and they're songs that hopefully make it better." Mavis has fond memories of the 'You Are Not Alone' recording sessions. "The session in that studio was more like a love-fest, like a family reunion. All of the Wilco guys, they would come through and bring their babies. All of those guys have girls - cute little girls - and Tweedy has two boys. They would come in, and the oldest one - Spencer, 14 - he has his own band. He's a drummer. And he's a photographer - he took a lot of the pictures that you'll be seeing in the CD. But what really got me was these two little guys came up to me one day and they adopted me! (Laughs) They said, 'Mavis, we don't have any grandmas. Will you be our grandma?' (Laughs) I said, 'Yeah, I'll be your grandma!' This was a first! I'm Auntie Mavis, I'm Godmom Mavis, but never a grandma! They adopted my sister Yvonne and I to be their grandmothers, and we felt so proud." Another of the album's most effecting songs is the stunning acappella version of "Wonderful Saviour". Mavis told journalist Simon Harper about recording the track, "Actually, Jeff had us go into the corridor of the Wilco loft, on the staircase. It was so cold. He said, 'Mavis, we're going to try this out here. There's such a good sound.' I said, 'I'm not going out there! It's cold out there!' This was in December when Chicago was freezing. This was our coldest winter in a while. So he just told someone, 'Get Mavis a cap and a coat and a scarf, and Mavis, go out and sing.' So we ended up doing it, and the sound out there was great." Mavis enthused, "I love this CD. It sounds to me so much like my family, which was the best music of my life, just my father's guitar and our voices. Pops always taught us that family is the strongest unit in the world. If you stick with your family, nobody can break you, nobody can harm you. You'll always have your family." Pops lived to see his family band inducted into the Rock And Roll Hall Of Fame before he died in 2000. Mavis was so bereft by his passing that she stopped singing for a time. "I was just a lost soul. I sang with my father for over 50 years and now all of a sudden he's gone, and I just dropped out. I'd sit down and I couldn't get up. My sister finally came to my home and she told me off real good. She said, 'You get up from here, you know that Pops would want you to continue to sing.' I was depressed, I was down, I was pitiful but when she talked to me like that, that was all I needed." Staples planned her return with a renewed imperative. "I've got to sing for Pops, I've got to keep my father's legacy alive because he started all of this. So I started calling people and nobody would give me a chance but I didn't let that stop me. I took money out the bank and I started making me a record, and I did it in this guy's basement." Staples says she was close to hawking albums herself out of her car boot when the prophetically titled 'Have A Little Faith' was eventually picked up by blues label Alligator Records in 2004. Staples was then signed by Anti- Records who teamed her with respected guitarist/producer Ry Cooder to create 'We'll Never Turn Back', on which she revisited some of the freedom songs that became such an intrinsic part of The Staple Singers' repertoire during the civil rights struggle of the 1960s. After the critical success of 'We'll Never Turn Back' she planned her next album, a live recording. With her friend Barack Obama about to go into the presidential election she recorded the blistering set 'Live: Hope At The Hideout'. She told writer Andy Whitman, "We recorded a live album in Chicago the night before the election, and you could feel the energy. We sang a lot of the old freedom songs, the old civil rights anthems, and the room was just electric. You could feel the triumph." Then she added, "But we're not done yet. Oh, it breaks my heart sometimes, but we're not done yet." One of the things Mavis is passionate about is breaking down the secular/sacred divide that exists in music. She tells a story about an early encounter with Bob Dylan: "When we first met Dylan, we were on a television show together and he was singing a song. Pops said, 'Listen, y'all. Listen to what that kid is saying.' And Dylan was singing, 'How many roads must a man walk down/Before you can call him a man' ['Blowin' In The Wind']. And Pops said, 'We can sing that song!' You see, Pops would tell us stories about when he was a boy down in Mississippi; he couldn't walk on the same side of the street as a white person. So he could really relate to what Dylan was singing. And that's how we started singing it. The Staple Singers were gospel singers, but if a song sounded inspirational to us, was something that would inspire people and that was positive enough, we would sing it. People would tell my father, 'What are you singing? You're supposed to be singing gospel!' At one point Pops got to the point where he said, 'Listen. Don't categorise us. We sing what is good for the people to hear.' He stopped categorising us, but I still say to anyone that I am basically and first and foremost a gospel singer." Mavis continued on the theme, "The Devil doesn't have any music. Ever since we were young kids, we sang songs that we thought of as positive music. Some of them were gospel songs. And some of them were message songs like 'Long Walk to DC' or 'For What It's Worth', songs that reflected the times we lived in. They were all true songs, you know. We just sang songs about the truth. And it seemed like people always wanted to hear those songs." 'You Are Not Alone' truly is a wonderful recording. 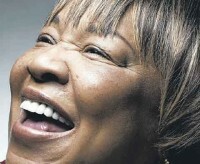 The vitality Mavis Staples shows at her age is remarkable and an example to many younger artists.